These petroglyphs, we didn’t know anything about them before and we didn’t know what they meant. We didn’t know much about them or about who wrote them. 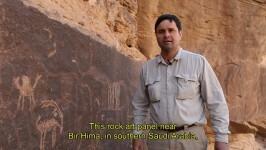 We don’t know, we are Bedouins, but we always said who wrote these petroglyphs, and where did these nations, or these Arabs that were here before our time go? We wonder how come they are gone but their writings are still here? Now it became clear to us that these are archaeological sites in our region, which is Al Garah, located between Idima and Bir Hima. English subtitles with English transcript.